Uganda seized a contraband shipment of ivory and pangolin scales it said was the largest the country had ever taken, with a market value estimated at more than $8 million. The haul originated in neighbouring Democratic Republic of Congo and passed through South Sudan before entering Uganda at a crossing on its northern border, Vincent Seruma, a spokesman for Uganda Revenue Authority said. Ugandan authorities started monitoring the cargo from the border while it was on its way to the capital, Kampala, on Jan. 24. The elephant tusks and pangolin scales were concealed in hollowed-out logs packed in three containers, which authorities opened on Thursday. Ugandan authorities have stepped up monitoring and seizures of contraband harvested from endangered wildlife as criminals collude with corrupt police to smuggle cargo from Congo and South Sudan, where state authority is fragile. The shipment was headed for Vietnam, Seruma said. Two Vietnamese men were detained in connection with the alleged transfer of the wildlife trove, he said. The value of contraband found in the one container they have opened is estimated at $3.5 million. The market value of all three containers is expected to reach at least $8 million, Seruma said. “It is our biggest-ever such seizure in one go,” he said. 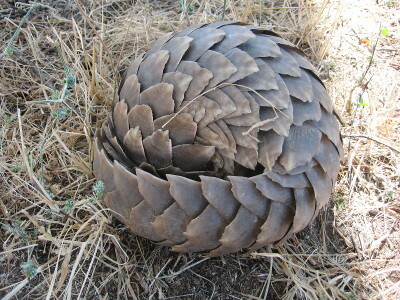 Elephant tusks, rhino horn, pangolin scales and other such goods produced and trafficked through east and central Africa are typically shipped to Asia, where they fetch thousands of dollars per kilo for use in ornaments and medicine.